It may have been only a matter of time before the millennial generation turned its attention to cohousing. As car and home ownership among young people has declined, and as the nuclear family is no longer the go-to living arrangement, it makes sense that college grads would look for ways share resources and living spaces well into adulthood. In China, millennials are drawn to co-housing models like Wowqu and You+, which encourage social activity among residents. Tenants are pre-screened and selected by housing managers, who say the arrangement helps alleviate the loneliness many young people felt growing up in single-child families. But not all of the responses have been positive. 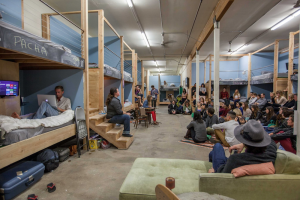 One common criticism is that these models cater to well-off college grads who can afford to pay for them – without having to take part in the collective decision-making or chore rotations common in egalitarian cohousing. And, they contribute to the commodification of the coliving concept. What do you think of these concepts? Would you recommend them to your child or grandchild as an entry-way into communal living? Are they a way for the cohousing model to grow on a larger scale? Leave your thoughts in the comments below!